that takes you through the city and beyond. Versatile Trekking: New experiences are within easy reach thanks to the 200km range reliable EnergyPak. The SyncDrive Sport Motor, delivers 80Nm of torque and has three speed control settings: Sport, Normal and Eco, ranging from 80-300% pedal assistance. Powerful disc brakes equip the ride for any terrain. Integrated Design: The reliable and easy-to-access EnergyPak is beautifully integrated into a lightweight ALUXX aluminium frame. Integrated dropouts make adding accessories easy and fenders and an integrated light on the head tube ensure Amiti E+ is ready for comfortable commuting. 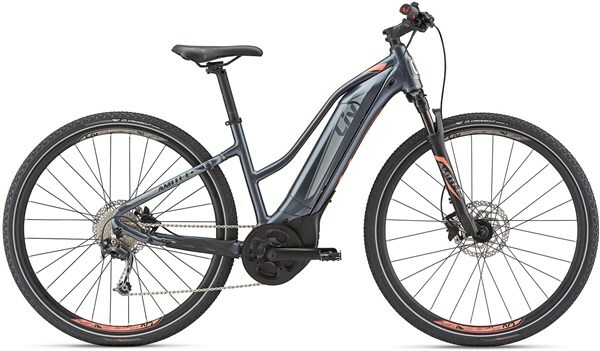 SmoothRiding: PedalPlus4-sensor technology smooths out bumps for a natural riding feel and the ergonomic RideControl EVO makes controlling pedal assist functions second nature with handlebar controls and clear key data indicators.